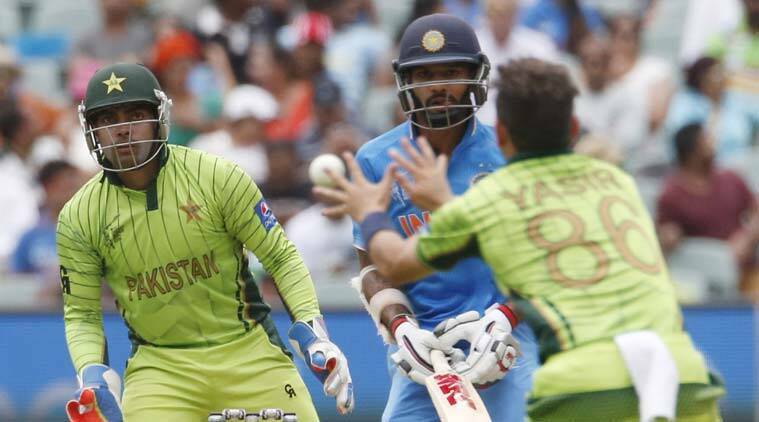 Kohli's ton was the highlight of Sunday's match, but Indian bowling too made things difficult for Pakistan. Toss: Half the battle was won when MS Dhoni got the spin in his favour. 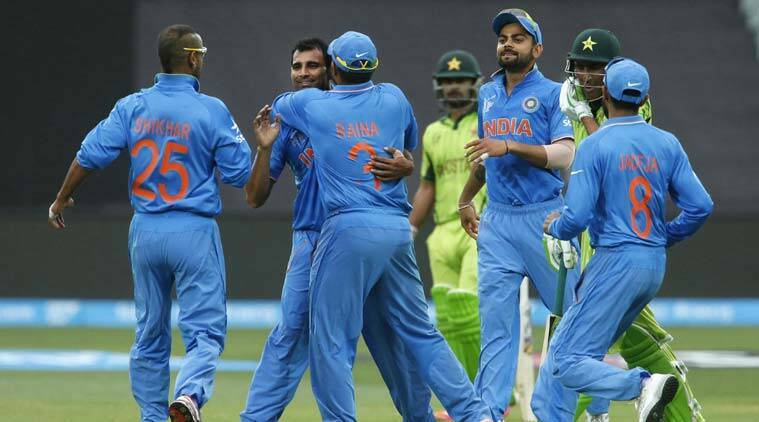 India are known to be good chasers but India-Pakistan is a different ball game altogether. A hard, true surface, unforgiving sun and a packed Adelaide Oval was just what the doctor ordered (pun intended) for a side which struggled to register a win in Australia for close to three months. India scored 300, Virat Kohli smashed a composed hundred and Indian batting, barring the late collapse, made most of the toss. Costly drops: Did Pakistan not watch Herschelle Gibbs dropping Steve Waugh, or dropping the Cup as they said, during the 1999 World Cup? If they didn’t, they will certainly watch, again and again, the two missed chances of Kohli. The first one came early in his innings when he attempted a big hit off Afridi in the 11th over of the Indian innings. Kohli didn’t get enough distance, and a charging Yasir Shah couldn’t get his hands under the dipping ball. It was a tough chance, but, they say, catches win matches. Kohli regrouped and stitched a crucial partnership with Shikhar Dhawan. 20 overs later, in the 32nd over, Umar Akmal gave Pakistan another reason to rip their hair out. 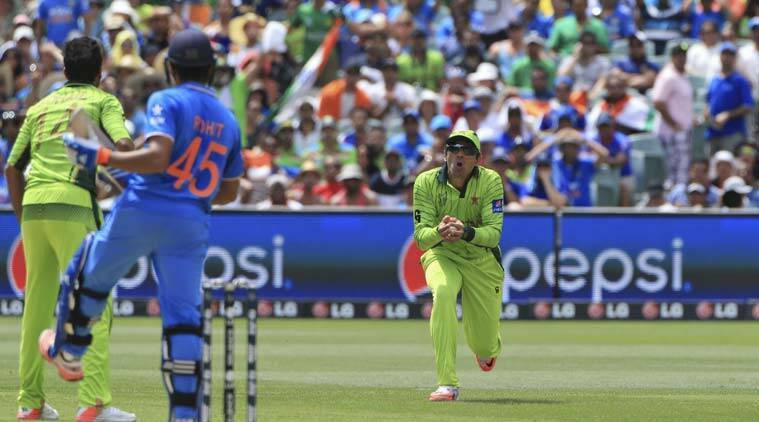 Haris Sohail found Kohli’s edge only for Akmal to drop it behind the stumps. Akmals and catches don’t go well, right? The spin struggle: Saeed Ajmal’s absence was felt in Sunday’s fixture. Pakistan spinners Shahid Afridi, Yasir Shah and the part-timer Haris Sohail looked very ordinary against the quality Indian batting line-up. The duo of Dhawan and Kohli provided a perfect manual on how to play spin in the middle overs. The Delhi Dashers rotated the strike well and didn’t mind to go a bit extra for a boundary every 2nd or 3rd over. Together they bowled 20 overs, conceded 136 runs, didn’t bowl a maiden and made no additions to the wickets column. Shehzad’s wicket: After Misbah, Shehzad was the most impressive batsman from Pakistan on Sunday. The opener, known to play his shots, exhibited a different side of his game. A side which was about rotating the strike, seeing off the good balls and dispatching the looseners. The fluent right-hander rebuild the innings with Haris Sohail, but Haris’ departure forced him to shift gears. With the run-rate climbing up, Shehzad started playing his shots. In the process, he slashed at a Umesh Yadav delivery only to present a catch to Ravindra Jadeja. His departure opened the floodgates as his side collapsed from 2/102 to 7/154. Bowlers fire all cylinders: How often does this happen that we see an Indian new-ball attack go under five? How often do our bowlers bowl with fire? How often do they attack the body? Not very often, right? On Sunday, however, it was a fresh start for Indian seamers ticked a lot of boxes at Adelaide. Shami’s 3.40, Umesh’s 4.83 and Mohit’s 4.33 are impressive economies. That too on a surface where the bounce was true and the ball was coming nicely on to the blade.